Today my non-fiction fashion history book A Victorian Lady’s Guide to Fashion and Beauty is out in paperback in the United States! It’s already available everywhere else in both ebook and paperback. I apologize that it’s taken so long for it to be available in the U.S. (and I doubly apologize if it’s already back-ordered here). A Victorian Lady’s Guide to Fashion and Beauty provides an overview of fashionable women’s clothing, accessories, and beauty essentials from Queen Victoria’s ascent to the British throne in 1837 to her death in 1901. It’s divided into sections which I hope will make it user friendly for anyone who (like me) needs to quickly reference the most fashionable gowns, hats, shoes, undergarments, or jewelry for any given decade. Along with descriptions of relevant fashions, I’ve also included sections on historical events to help put the fashion trends in greater context. There are even sections on the House of Worth, Empress Eugenie, the advent of the Victorian department store, and the dawn of the black evening dress. 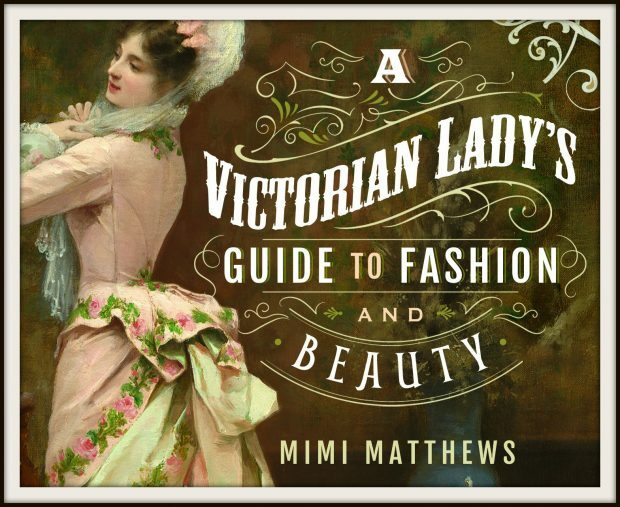 For more about A Victorian Lady’s Guide to Fashion and Beauty, including reviews and buy links, click through to its official book page HERE. Or, to order the paperback directly from Amazon, Barnes and Noble, or Pen and Sword Books, simply use one of the links below. If you purchase a copy of A Victorian Lady’s Guide to Fashion and Beauty please do stop by my Facebook or Twitter page and let me know so that I can thank you personally. And please don’t forget to leave a review at Goodreads and/or Amazon! So glad it is finally here! I just ordered this book. Looking forward to reading all about those unanswered questions. I love making historical outfits for dolls and I belong to several Sherlock Holmes Societies.